One voice among the 13 that sang in seamless unison Thursday night at the Seabury Center was familiar to many in the audience of about 125 people. They had heard it before during many of Westport's annual First Night performances or concerts of Staples High School choral groups. It belonged to Alan Southworth, a Westport native and 2010 Staples graduate, who now sings bass with the prestigious Princeton Nassoons, an all-male a cappella singing group of Princeton University students that shares its brand of perfect-pitched harmonies and humor with audiences throughout the world. The Princeton Nassoons have the pedigree if not the longevity of their famed Ivy League counterparts, the Yale Whiffenpoofs. 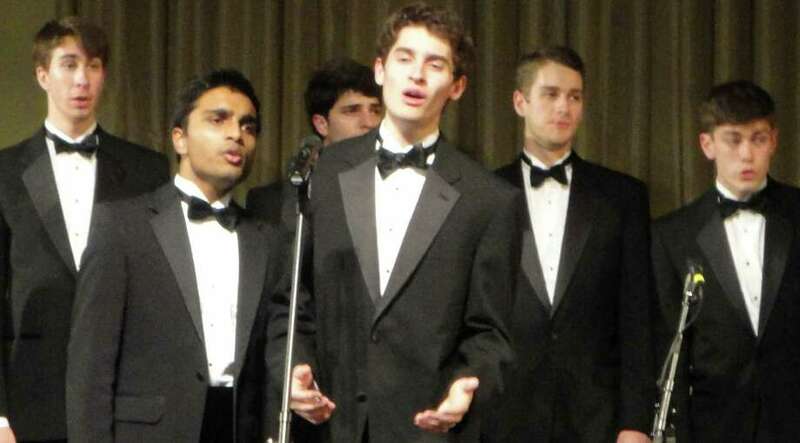 The Nassoons is Princeton's oldest a cappella group. It was established in 1941; the Whiffenpoofs' history dates back to 1909. "When I was a kid we did First Night every year," said Southworth, the current president of the Princeton Nassoons. He said he first performed on the stage of the Seabury Center when he was 10 years old with his parents Frannie Faith Southworth and Jeff Southworth. It was the first public venue for his music, which, until then, was limited to home. Music "was always an outlet for me," he said. Southworth, a junior at Princeton studying geo-sciences and sustainable energy, also played violin and piano as a child but chose to focus on chorus when he got to Staples. He knew he wanted to continue singing in college, which influenced in part his choice of Princeton University. Southworth was reunited Thursday with his Staples choral director, Alice Lipson. "I'm so proud ... Magic, the kind of person you would pray would walk into your classroom," said Lipson, who retired the same year Southworth graduated. He sang tenor back then but Lipson said, "I remember him trying to sing the lowest noted he could possibly sing." The Princeton University chorus performed a concert of holiday and other music opening for the Westport audience with Paul Simon's "Diamonds on the Soles of Her Shoes." The program also included a jazzy, wordless version of "Carole of the Bells," "O Holy Night," as first interpreted by the boy band In Sync, "Have Yourself a Merry Little Christmas," and a comical version of "The Twelve Days of Christmas" that featured complicated lyrics. They also performed a medley of Hanukkah songs, a Muslim song about whirling dervishes, and the Beatles' "You Won't See Me." In a moment that honored Southworth's musical heritage, his mother was invited on stage to sing with the Princeton Nassoons. With Fannie Faith Southworth singing lead vocals, together they performed Joni Mitchell's "River," which opens with the lyrics, "It's coming on Christmas ..."
In one song, the bakers dozen of male singers made a subtle key change that highlighted their technical skill as well as their musical talent and vocal precision. "They're amazing. They're so coordinated. Their tone is impressive," said Justin Honigstein, a friend of Alan Southworth's from the time they were 2 years old. Honigstein also sings with a university a cappella group, the co-ed Bison Chips at Bucknell. The Princeton singers were at their best in unison, but their strong and pleasing individual voices were showcased in solos. Southworth was the featured soloist on the song "Lies" from the Broadway musical and motion picture "Once," with Krishna Choudhary, also a junior singing backup harmony. The Princeton Nassoons may be featured in Tina Fey's upcoming film "Admission," with a scheduled release date of next March 8. The group was part of the filming but until the movie comes out on the big screen its members won't know if they will be included or if their scenes were left on the cutting room floor. Until then, they will continue their studies and their performing schedule, which takes them on a handful of performances throughout the nation each year and on one international tour, which this year will have them performing in Hong Kong.